With a genetic patch, Mardax can metamorphose into Mardev. It is better designed for melee combat, with more robust jaws, looser skin on its face and throat, and a barb on the end of its tail which can be superheated for stabbing opponents. 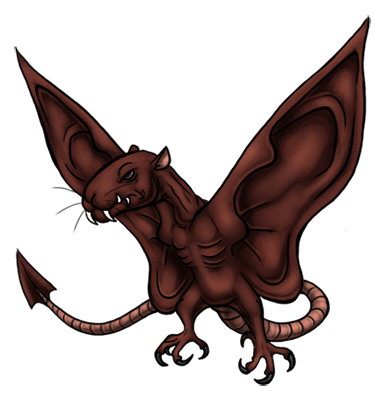 To compensate for its smaller ears, its earlike wings have grown longer and much more sensitive. Though it is a ferocious predator with a satanic visage, its disposition is pretty mild. It shows affection towards its Tamer and others it regards as family, and will deliver them screaming, mortally wounded prey as a token of its gratitude.